In this post, I will attempt to explain all about potatoes, explain the varieties available and when to choose one over another. What is the difference between potatoes? Next time you go shopping for potatoes, you will have a lot more knowledge about them after reading this post. Tried to make french fries from scratch only to have them turn out limp and soggy? Tried to make potato salad or put nicely diced potatoes in a soup only to have the potatoes all fall apart? Ever had your mashed potatoes turn out like glue? It all has more to do with the potato you chose to make the dish with than your culinary skills, which I am sure are impeccable. There are few categories in the potato world. Basically there are low-moisture, high-starch varieties and high-moisture, low-starch varieties. The high starch varieties will fall apart if cooked in liquid but create light and fluffy mashed potatoes, crisp french fries and crispy chips. 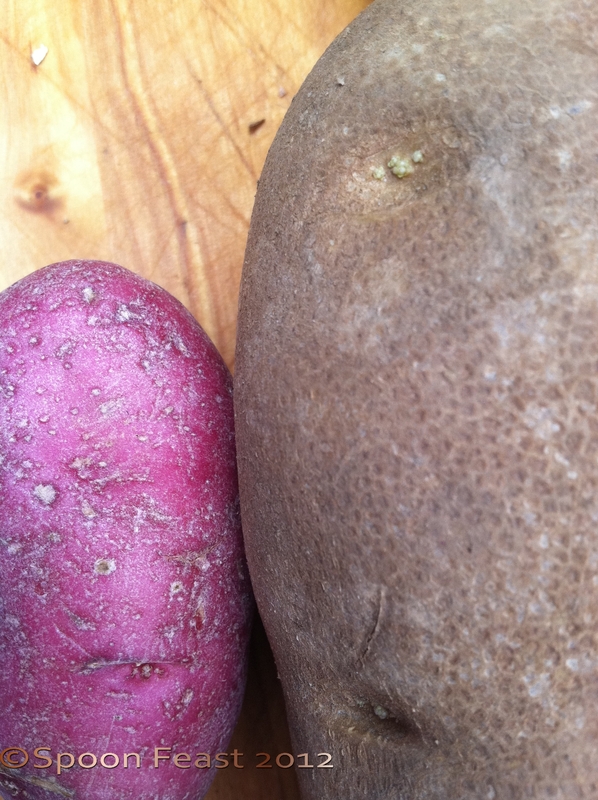 Russet Potatoes – notice the dark, thick skin. Compare this to a new potato which has a thin tender skin. The russet is the king of the low moisture-high starch category. These potatoes have thick dark skins as opposed to the thin tender skin of new potatoes. 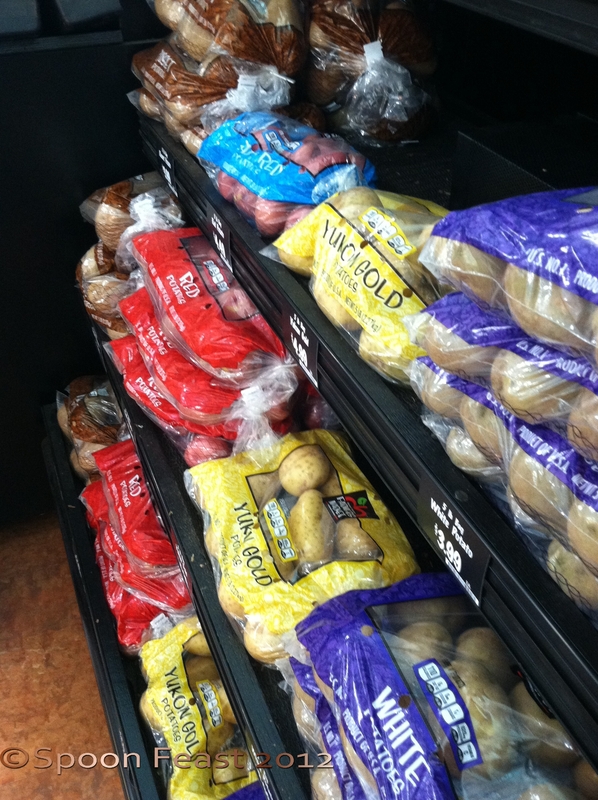 The low starch – high moisture category belongs to red potatoes, Yukon gold, new potatoes. All potatoes with a tender thin skin will be high moisture, low starch potatoes. These potatoes hold their shape in soups, casseroles and salads. Their tender skins are often deep-fried and used a receptacles for dips, spreads, chili and salsa. Go to the store and buy some of each variety and compare them. Cut them, notice the textures. Cook some of both using a variety of cooking methods and compare results. Make notes so you can remember what you discover during this experiment. Then we have sweet potatoes and yams. 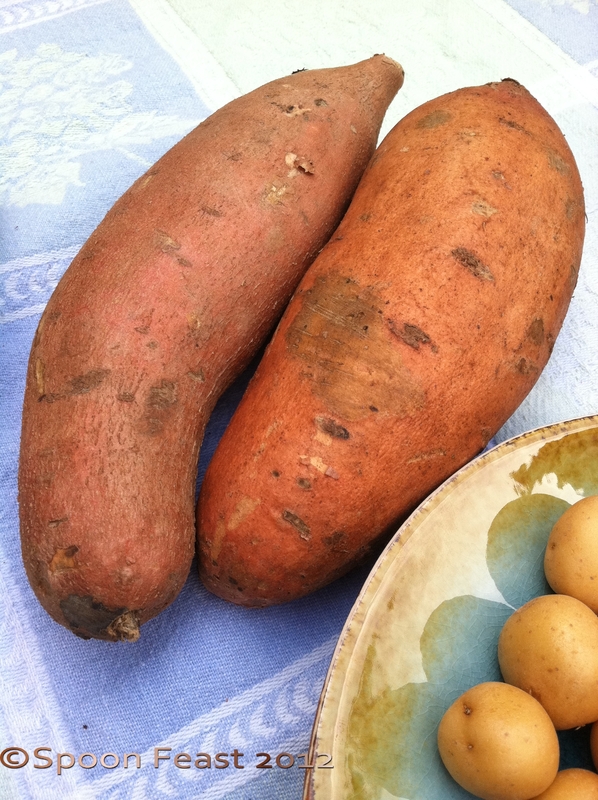 Yams are not as high is sugar as sweet potatoes are but they taste just a good. 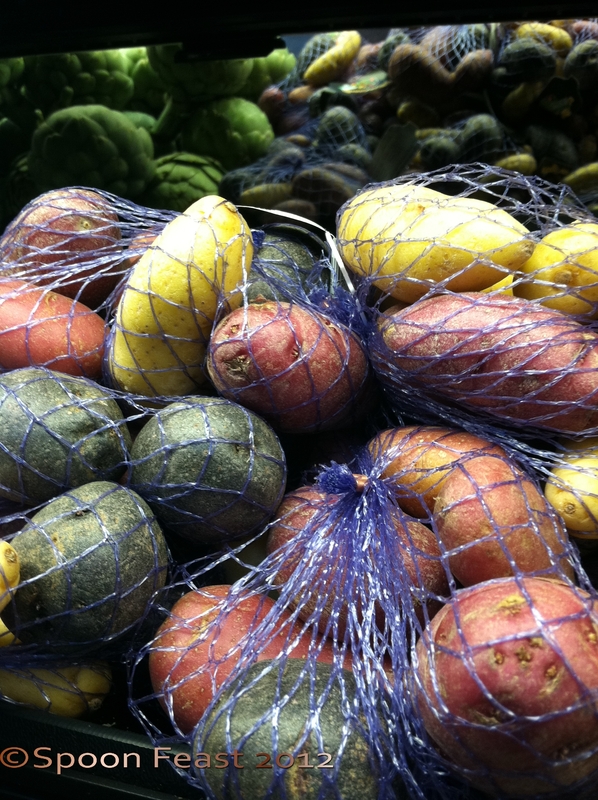 Be careful with large varieties of these potatoes as they can get very stringy. Choose smaller, even sized, good color and smooth skins when selecting these potatoes for purchase. Typically, sweet potatoes and yams can be used interchangeably and can be applied to a many cooking methods. The skins are not edible. Colors vary from pale yellow to deep orange and now there are garnet and purple varieties too. 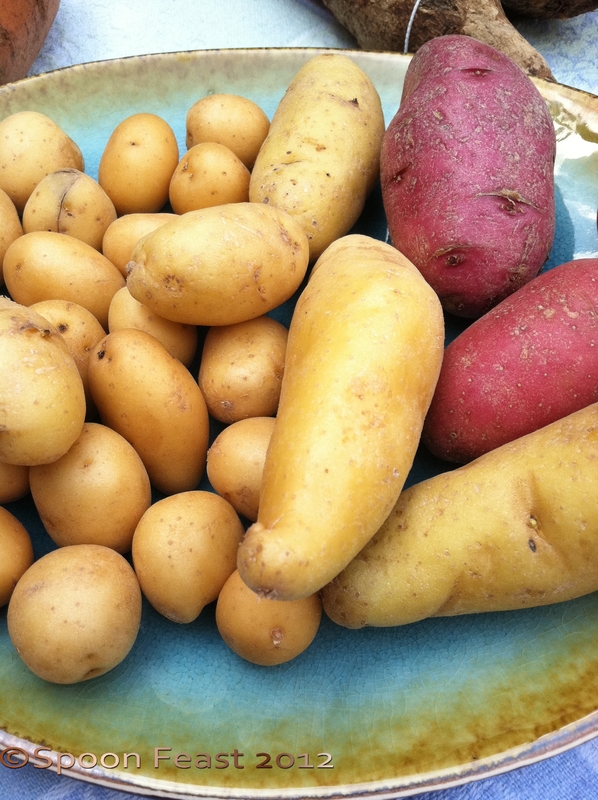 Tiny new potatoes, fingerling potatoes, “potato gems” are all varieties that belong in the low starch, high moisture variety. their size and shape make them special in that you can cook them without peeling or cutting them if you wanted. Some of this variety are so moist and tasty, you never miss the butter. 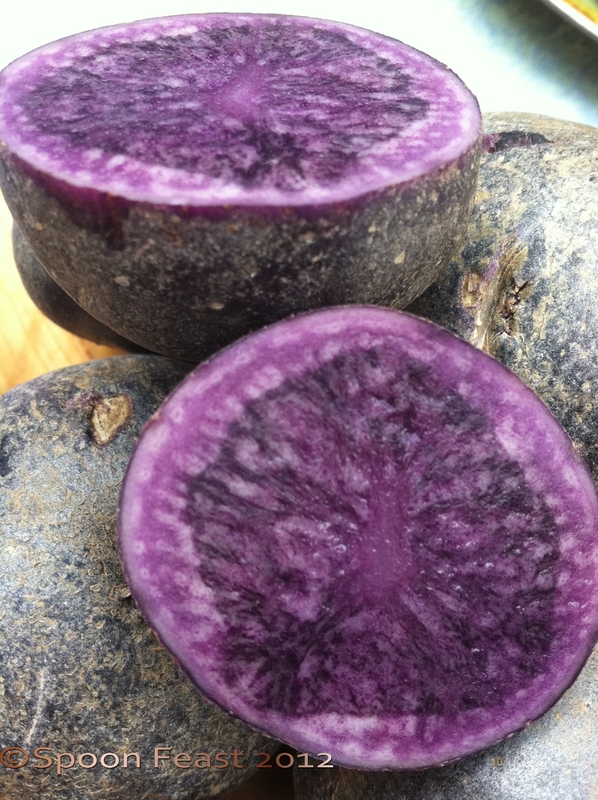 Have you ever seen a blue or purple potato? They really are blue or purple throughout. And they stay that way when cooked. When you have purple asparagus or purple carrots, they lose the purple color when cooked. Purple potatoes do not! For the most part, you can use them as a high moisture low starch potato, but they do mash well without turning into glue or paste. 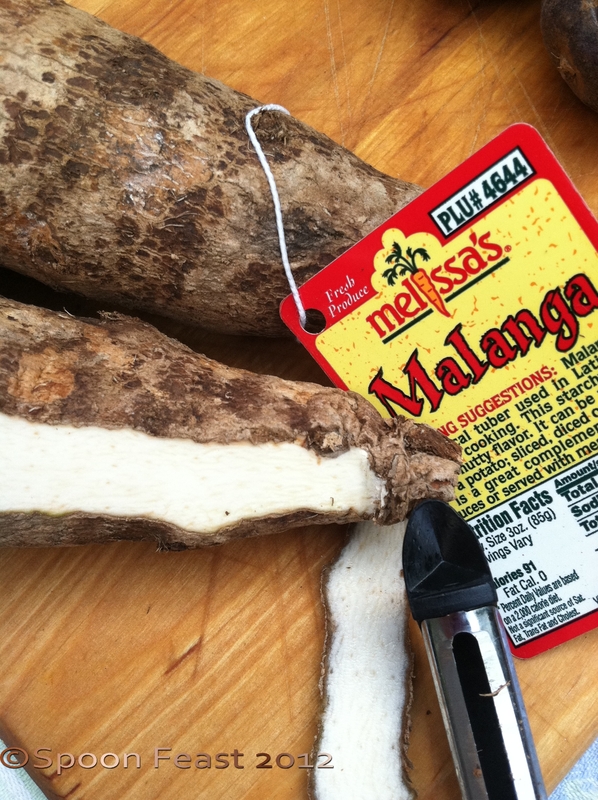 Additional varieties from the potato world include Malanga, Boniato which take to any cooking method potatoes do. Boniato, inside flesh is white. Use these as you would sweet potatoes. 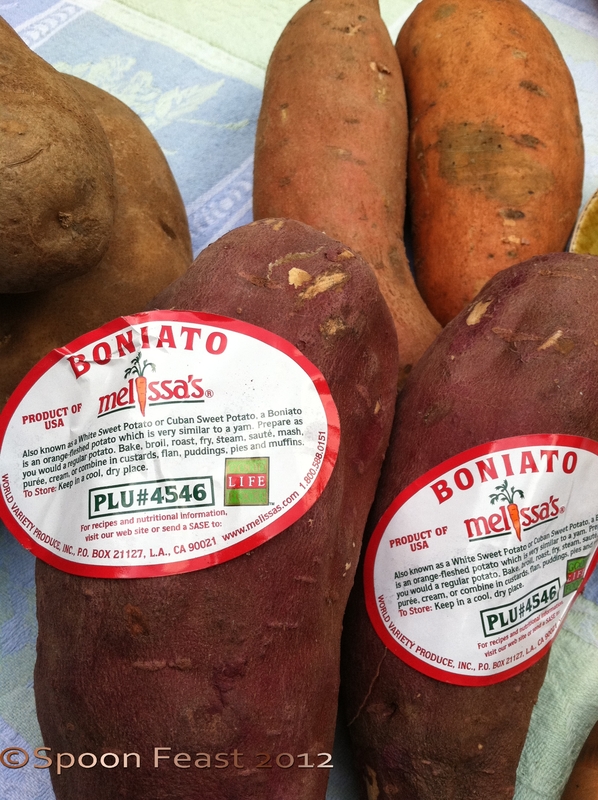 Here in the US, Melissa’s Brands offer several unusual varieties not only of potatoes but of all unusual, hard to find produce items. Be adventurous and try a different kind of potato next time you go shopping. When choosing what potato you want, if you want a potato to hold its shape as in soup, choose a high moisture low starch. For fluffy mashed potatoes, select russets and run cooked potatoes through a ricer, not a mixer. perfect mashed potatoes is another post soon. For great french fries you need a low moisture potato with high starch. 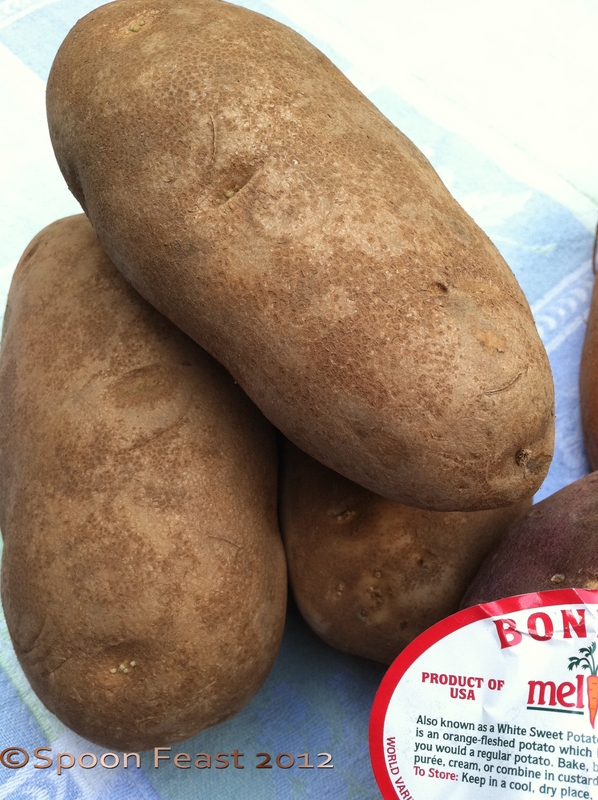 Again russets are your best choice but you can also use “All-purpose potatoes” or “chef’s potatoes”. These labels indicate a moderate amount of starch and moisture and can be used in any potato recipe. This is why sweet potato fries are mostly limp, they have too much moisture to get fluffy like russets do. Sweet potatoes also break down your frying oil faster due to the amount of natural sugar in the potato. To hold the shape as in soup, potato salads, use red or white skin potatoes, you can also find blue ones in this category. Never store potatoes in the refrigerator. The cold converts the starch to sugar. Always store potatoes in the dark, in a dry place. I keep mine in a cabinet that isn’t used much. It would take a boatload of solanin consumption to have an effect, but it is an intestinal irritant. You choose. There will be doing a series of posts of cooking potatoes and selecting the right one for the recipe in the next few weeks. In the meantime, choose something different and play! 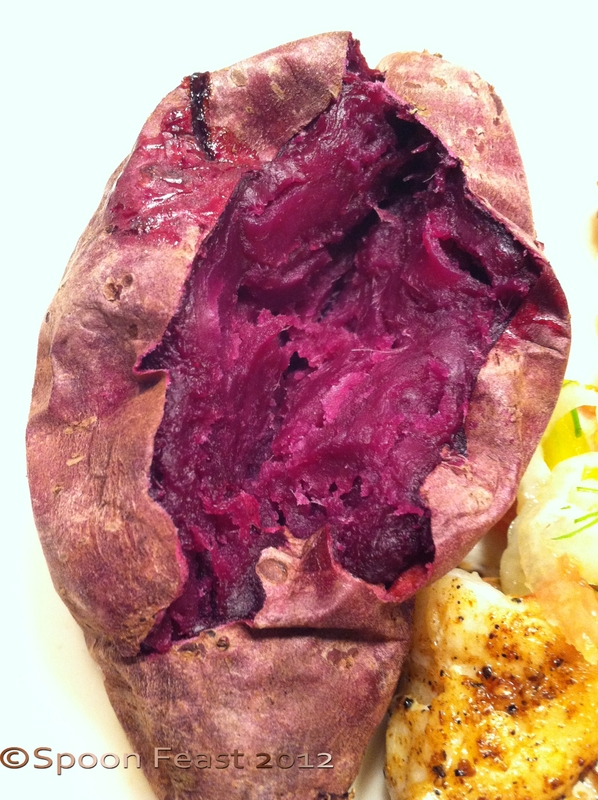 Inside of a purple potato; notice the color of the skin in the background. Inside a baked garnet sweet potato; isn’t that a great color?! This entry was posted in basic skills, Cooking, Southern Cooking, To Tyler: How to Cook:, What every good cook should know and tagged cook, diced potatoes, dinner, french fries, Mashed potato, new potatoes, Potato, Potatoes, Russet Burbank potato, russet potatoes, Starch, vegetarian, Yam, Yukon Gold potato. Bookmark the permalink. This is the ultimate potato post for sure – I knew there were different varieties but to this extent I would never have guessed – and with so much to do with them too! I wonder if you can create a sweet treat with them? You are so good with sweets. This is a very informative post. I can answer yes to each of your questions. I had a baked potato explode in the oven for the first time in my life last year. What a total mess and getting all of the potato out was a major job…had to take the oven apart. Thank goodness I have learned from my mistakes. 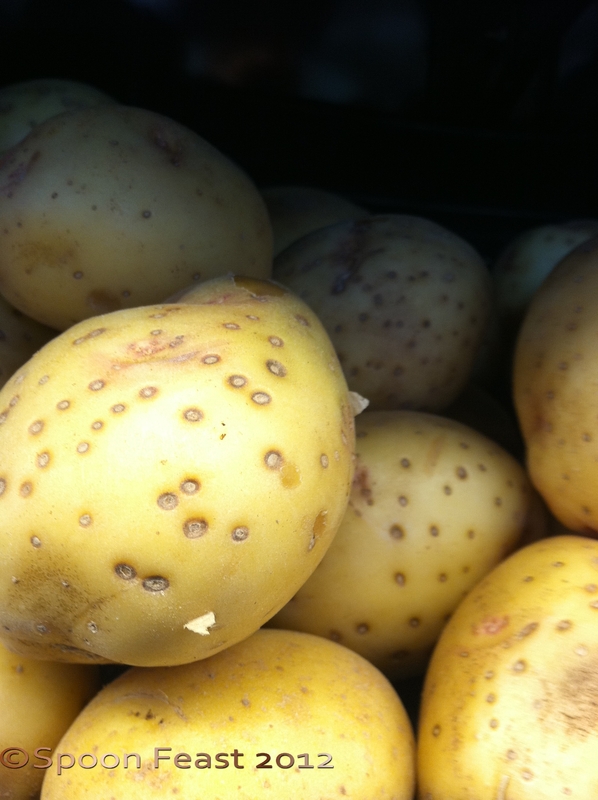 Just pierce each potato with the tip of a knife before baking. It lets the steam escape which is what causes the explosion. Yeah, awful mess to clean! Great post. There are so many great varieties of potatoes. We are seeing more in the U.S. but nothing like the variety you find in Europe. Hopefully, we will see more soon as the market demand increases. Yes, the more sophisticated consumers become, the demand builds and then you can start to see the availability of greater choices. I love how that works! Excellent potato post. I leanred a lot. Thank you for the hard work.